I in no means mean this to be a sappy or depressing post. I have thought of a million ways to start it. Cancer is a terrible, horrible, scary disease. 10 years ago I arrogantly felt like I assume many do "it won't happen to me." Unfortunately that's the way cancer works. It wasn't me. It was Walt. I met Mr. Mayer in the spring of 2001. We had dated for about a month when he introduced me to his parents. I fell in love with them instantly. I will never forget that first meeting. Mr. Mayer had me over for lunch. I was a very poor college student so I would never turn down a free lunch! His mom had made an elaborate spread. I later learn that is just how she does things. She had made a ham. I LOVE HAM! We all sit down at the dining room table. Up until this point Mr. Mayer's dad, Walt, hadn't said much. Mr. Mayer's mom, Lana, brings out the ham...Mr. Mayer says "Mom, I forgot to tell you. Jayna is Jewish." I'm mortified. I'm not Jewish. Lana is flustered and starts apologizing. Mr. Mayer is cracking up. And Walt. Walt puts his napkin in his lap and says "We have some peanut butter in there if you want a sandwich." He then fills his plate with some ham. I'm so embarrassed I don't say anything. I finally get out "I'm not Jewish." Lana threatens to strangle Mr. Mayer. I have never eaten a piece of ham without thinking of that day since then. Walt and I gradually build a relationship with each other. Mr. Mayer has always said that I knew his father much differently than he did. I mentioned above that I was a very poor college student. I had 4 jobs and was barely making it through. 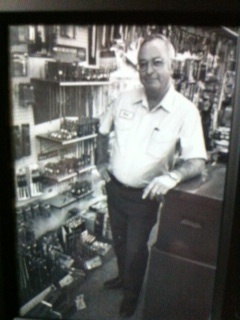 Walt owned a hardware store. He would let me come in on my time off and do odd and end jobs for way to much money. I appreciated it. When Mr. Mayer and I started dating I lived in an old house with some roommates. The house was dilapidated and the landlords were charging us an arm and a leg to live in it. Walt knew some people at the housing authority. One day he calls and tells me he spoke to someone and I can move into one of their income based apartments next week. THRILLED! I had been on a waiting list for over a year! I had an old dresser and matching chest of drawers that needed to be refinished in a bad way. Walt said that he would help me if I wanted to bring them over. I went over every night after work and I worked on the furniture. Walt showed me how to sand, fill in gaps and holes and stain it. Every night after I would leave Walt would redo what I had done. I knew that's what he was doing. I always thought it was so nice that he helped me and made me feel like I was contributing. The dresser and chest of drawers turned out beautiful. Diva uses them now. I will never let them go. Walt took an old table I used for a make up table that my great grandfather made as a kid. He refinished it and turned something ugly and falling apart into something beautiful. It's another piece of furniture I will never let go. Mr. Mayer and I got married in May of 2003. It was a whirlwind. I graduated college one Saturday and the following Saturday I got married. Everything is blurry. I do remember at the rehearsal dinner Walt said to me as we were all getting ready to leave "You know, I always wondered what it would be like to have a daughter. I guess I'll find out." That's as close as Walt ever got to affection. He was more of a doer than a sayer. He sat in a parking lot with me for 2 hours while a locksmith worked on the ignition of my car. It was a locksmith he had called for me. Mr. Mayer and I had a lovely wedding...from what I remember. It was a very happy day. We didn't know that 11 months from then Walt would be gone. The cancer was discovered Labor Day weekend. Walt had been having some bizarre behavior and problems. We had gone to Angelfire to share the holiday with Walt and Lana. We arrived and turned around and came home the next day with Walt. Those next few days are a blur. The cancer started in his lungs. By the time we found it, it had spread to his brain and liver. Walt fought hard. There was chemo, radiation and specialized treatments in Oklahoma City. We were living in Tulsa and went to Ada every weekend. We were all confident that Walt would beat the odds and survive. We kept that attitude until late March. We found out that all the treatments hadn't done anything. Walt was tired. By this point he was not himself. Hospice was contacted. Two weeks later we lost Walt. You know how "they" say that a person will wait until everyone is there? It's true. Walt waited until everyone was there from Tennessee, DC, Tulsa and other places in between. It was Good Friday, April 9, 2004. I can't celebrate Easter without thinking about that. To say my first year of marriage was rough is an understatement. I don't remember much of it. But it made us stronger. Cancer is an evil disease. It doesn't just affect one person, it is wide spread. My heart breaks for all the families that have to go through the fight because I know the heartbreak. I know the ups and downs that comes with it. I only had Walt in my life for a very short time. But, he made a huge impression on me. He was someone I loved very much. As I watch my kids grow up I can't help but feel a little cheated that they will not get to know him. Owen looks just like him. He even makes the same facial expressions that Walt made. He has the same quiet and patient temperament that Walt had. We talk about Walt with Diva. At this point she doesn't understand why she can't see her "Papa Walt" or why he is in Heaven. I hope that someday she will. Time marches on and we have carried on with our lives. I continue to think about Walt and wonder what our future would have been like. I'm convinced that he would be bananas about his grandchildren. Mr. Mayer agrees and says that it would be ridiculous. It's FRIDAY!! Tomorrow is SATURDAY!! !